One of the major risk factors for cerebral palsy (CP) is damage to the brain’s white matter. In preterm infants, white matter damage often stems from asphyxia (oxygen deprivation), but in term infants the cause of damage may occasionally be difficult to determine. However, new research by Arne Jensen and Bert Holmer, published in Obstetrics and Gynecology International, provides evidence that white matter damage is often the result of cephalopelvic disproportion (CPD) and prolonged labor. Cephalopelvic disproportion is a complication in which the baby’s head is too large to fit safely through the mother’s pelvis. CPD can cause prolonged labor and cerebral compression ischemic encephalopathy, a type of neonatal brain damage that results from excessive pressure on the baby’s head. Jensen and Holmer conducted cranial ultrasound screenings on infants during the neonatal period. Repeat screenings were done on babies showing signs of cranial abnormalities. They also collected obstetrical data from the birth records, including information on the infants’ overall sizes and head circumferences. The authors found that 1.3% of newborns had white matter damage, but that some of them were asymptomatic. Infants with small head circumference (below the 10th percentile) or large head circumference (above the 75th percentile, but especially above the 90th percentile) were at an increased risk of sustaining white matter damage. Small babies were likely to exhibit certain symptoms of brain injury, but infants with large head circumference and white matter damage were sometimes “clinically unremarkable.” In infants above the 75th percentile for head circumference, white matter damage sometimes occurred in the absence of asphyxia. The authors suggest that cephalopelvic disproportion leading to prolonged labor, cerebral compression, and white matter damage could be “the missing link between the insult that escapes diagnosis and the development of unexplained developmental delay and cerebral palsy in childhood.” Moreover, they note that this causal pathway could also explain why cerebral palsy is more common in males than females (male infants tend to have larger head circumference). Generally, appropriate management of cephalopelvic disproportion involves a C-section delivery. Unfortunately, physicians often fail to perform C-sections in a timely manner, instead allowing prolonged labor to continue. Another common mistake is prescribing a labor-enhancing drug such as Pitocin, which is generally risky (it can lead to uterine tachysystole and other dangerous complications) but especially ill-advised in cases of cephalopelvic disproportion. Physicians should follow standard of care when managing cephalopelvic disproportion. Deviation from standard of care is negligence, and if this negligence leads to permanent harm, it constitutes medical malpractice. 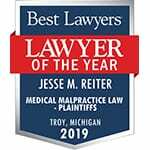 If your child has cerebral palsy or another developmental disability, and you believe it may have resulted from medical malpractice around the time of their delivery, the birth injury attorneys at Reiter & Walsh ABC Law Centers may be able to help. To find out if you have a case, contact our firm to speak with one of our attorneys. We have numerous multi-million dollar verdicts and settlements that attest to our success, and you pay nothing unless we win your case. We give personal attention to each child and family we help, and are available 24/7 to speak with you. Jensen, Arne, and Bert Holmer. “White Matter Damage in 4,725 Term-Born Infants Is Determined by Head Circumference at Birth: The Missing Link.” Obstetrics and Gynecology International 2018 (2018). Schifrin, Barry S., Pierre Deymier, and Wayne R. Cohen. “Cranial compression ischemic encephalopathy: fetal neurological injury related to the mechanical forces of labor and delivery.” Stress and Developmental Programming of Health and Disease: Beyond Phenomenology. Nova Science Publishers, Inc., 2014.